We'd played the Switch before but we were still surprised at how small the box was when it arrived. It's not that much bigger than a shoebox. The photos on the side of the box really emphasize the various ways you can set up the Switch. Is this the back? Is it the front? Where does the Switch end and the player begin? You too would ponder deep philosophical truths if you were photographing a box. This box has two sides. Or four, actually. Wait--could it be six? This is certainly a side. This is definitely supposed to be the bottom. That's usually where they hide all this useful information. One last look in all its untouched, pristine glory before we get to opening. And this is what you'll see when you open the thing. 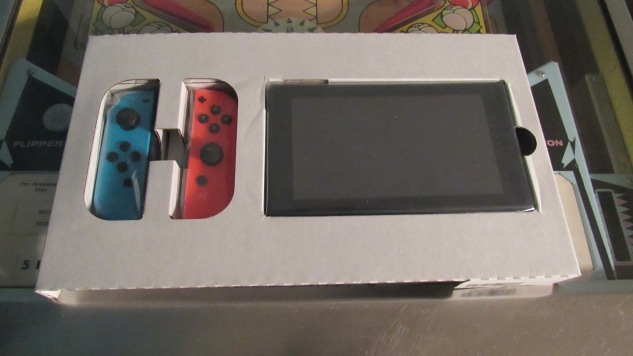 The two Joy-Con controllers and the Switch tablet itself are right on top, wrapped in plastic and set inside a cardboard plate. Here's what you see when you lift up the top section containing the tablet and controllers. As usual, the box is broken into a variety of cardboard chambers and segments, each holding a different cable or doodad. That mess of paraphernalia in the belly of the box includes the Joy-Con Grip, which turns the tiny handheld controllers into a more traditional joypad. It also includes an HDMI cable, two straps that connect to the back of the Joy-Cons, and, of course, an AC adapter. Let's take a closer look at the Grip. To play the Switch on your TV, you have to use a dock. We're guessing that's what's in here. Yep. It's the dock. The tablet slides right into this thing, which has an HDMI output and a USB port. You can just leave this in your entertainment center and bring the tablet along with you whenever you'd like, and then easily recombine the two when you get home. It also works as a charger for the tablet, although you can plug that directly into a power outlet, too. Here's a closer look at the Joy-Con controllers. They're certainly small and light. The tablet is the heart of the Switch. It's not just a secondary screen, like the Wii U's Gamepad, but literally the console itself. Here's where all the technology needed to run the new Zelda and next Mario rests. And here's what it looks like from behind. When the Joy-Cons are snapped onto the tablet, you have a fully functional portable console ready to take with you anywhere you go. It might look like it would awkward, but we've played the new Zelda in this configuration for hours, and it's felt pretty comfortable and natural the entire time. If you're used to playing the 3DS or the Vita, and also have experience with an iPad or other tablet, the Switch probably won't feel awkward at all. Here's what the Switch looks like when it's docked and attached to a TV. The back of the dock snaps open, letting you plug the HDMI cable and AC adapter into place. There's a USB port inside this compartment, along with two more on the exterior of the dock. The Joy-Cons slide easily into the Grip, snapping into place to form a more traditional videogame controller. And that's what you'll be bringing into your home whenever you pick up a Switch, whether it's next week or at some point in the future. Paste will have more on the Switch and its launch games next week. The Nintendo Switch is barely a week away, launching worldwide on Friday, March 3. If you can’t wait to see what the console / tablet hybrid looks like in the real world, though, here’s a look into the unboxing process as Paste opened up its Switch for the very first time.